A local 1960s pool in Smethwick has received a sea life transformation. Smethwick Swimming Centre now has a shark, dolphin, whales and huge sea turtle in residence at their pool. 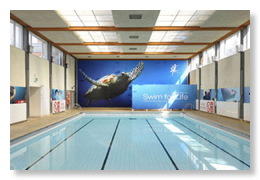 The old grey wall tiles and boarded over walls and windows of the small pool have now been replaced by dramatic real still life images from the sea.